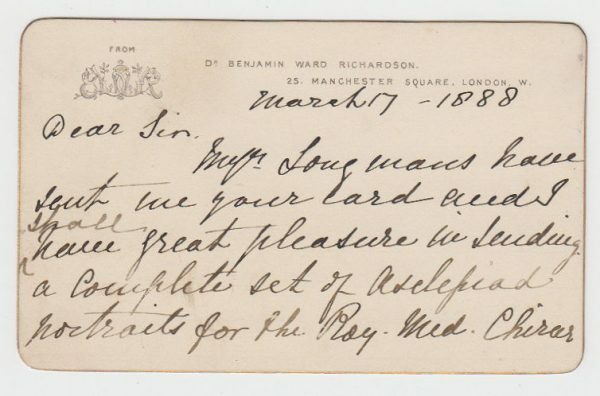 Autograph Correspondence Card Signed ‘B.W.Richardson’, to J.W.MacAlister, agreeing to send “a complete set of Asclepiad portraits” for the Surgical Society library. Two sides of card, 3 x 4 inches, in good condition. 23 Manchester Square, 17 March 1888. 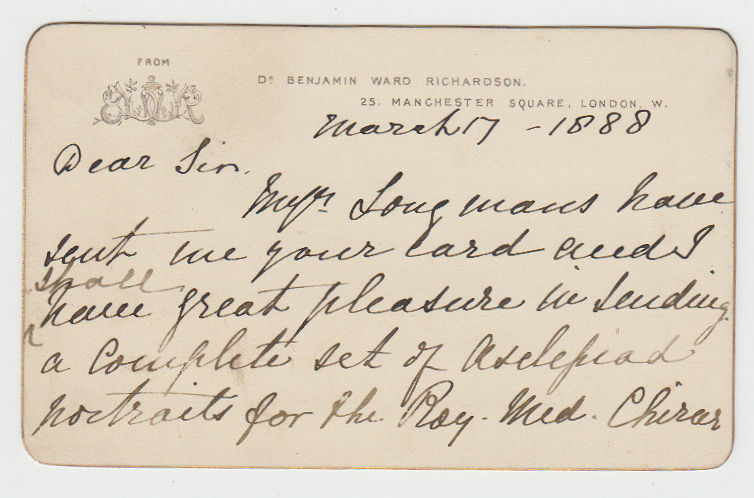 Benjamin Ward Richardson (1828-1896), surgeon, sanitary reformer, and prolific writer. He continued, and extended, John Snow’s work on inhalation anaesthesia and brought into clinical use, no less than fourteen anaesthetics, of which methylene bichloride is the best known, and he invented the first double-valved mouthpiece for use in the administration of chloroform. He also made known the peculiar properties of amyl nitrite, a drug which was largely used in the treatment of angina pectoris, and he introduced the bromides of quinine, iron and strychnia, ozonized ether, styptic and iodized colloid, hydrogen peroxide, and sodium ethoxide, substances which were soon largely used by the medical profession.